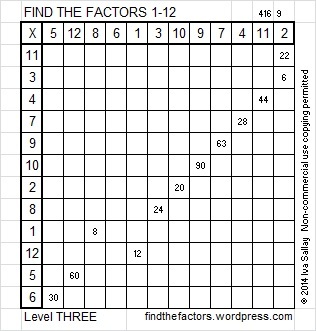 In the past finding the factors for a level 3 puzzle has been like lacing an entire shoe with only one end of the lace. Today’s puzzle is slightly more difficult because that end of the lace gets cut off in the middle of the puzzle, and the other end of the lace has to be used to find the rest of the factors. Level 3 is meant to be a bridge between the easier levels and the higher leveled puzzles, and those laces get cut off in the higher leveled puzzles all the time. Good luck with this level 3 puzzle! I’m sure you can still find all the factors! 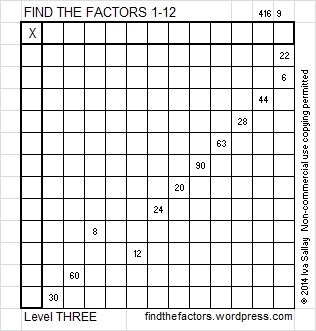 98 is never a clue in the FIND THE FACTORS puzzles. ← 97 and Will This Six-legged Puzzle Bug You?